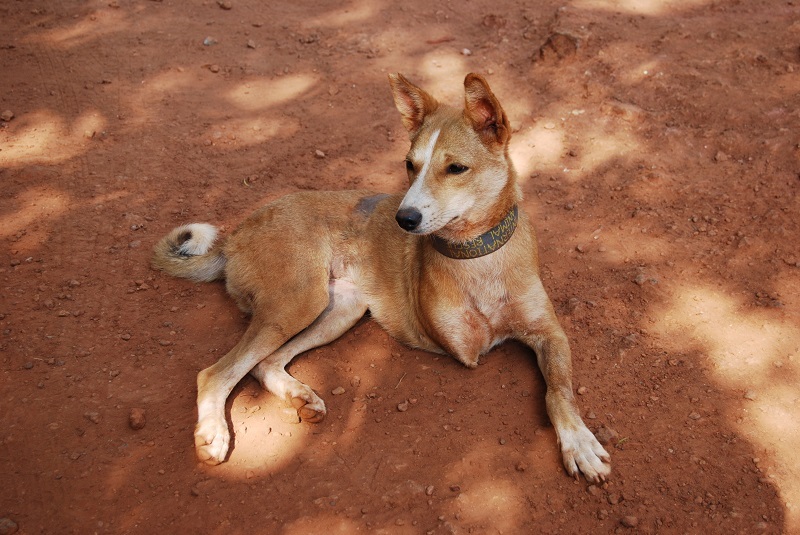 My name is Olive and I'm a member of the family at International Animal Rescue's centre in Goa, India. Woof! I'm Olive Oyl and I live at Animal Tracks, the IAR centre in Goa. I meet and greet everyone who comes through the gate. I still can't believe my luck - I was down and out on the streets, but IAR rescued me in the nick of time. Now I’m a real VIP - a Very Important Pooch with her own blog to tell you how it is with us in Goa. Life is great, and thanks to International Animal Rescue and its supporters I'm here to tell the tale! WARNING: Contains graphic images of injury! As many of you may know, most of the dogs that pass through the International Animal Rescue centre here in Goa are issued with an IAR collar (or belt as they are called here). They are made of fabric with the words “International Animal Rescue” woven through and have an elastic join for our comfort and to allow them to easily come off in an emergency. These identification collars serve as a visual indicator that a dog has been vaccinated and operated at Animal Tracks, along with the “V” shape nick in our ears and a tattoo that is imprinted whilst we are anesthetised during the neutering operation. The collars especially can be easily seen when the Animal Tracks human team are patrolling in the IAR vehicles, ever on the lookout for un-neutered strays and other animals in need of help. But of course, adopted pups are never issued with an IAR collar - those of you who have experience in rearing a pup know too well how soon they outgrow their collars, so only the full grown adults are presented with one. 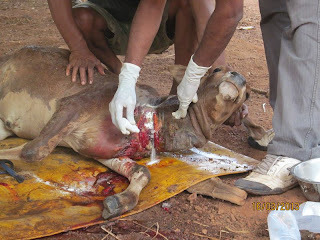 But many animals, including pets and livestock, are fitted with collars or halters soon after birth. They fit them for a short while, but not very long at all. 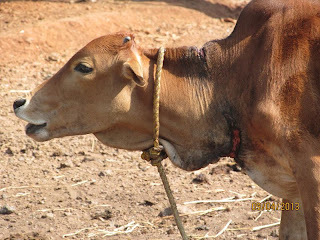 Sadly some people then seem to disregard the ever tightening noose that is slowly strangling the animal and cutting into the growing neck. 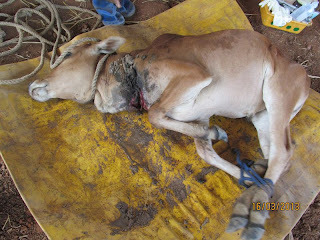 Many cases requiring emergency release from tight collars and neck ropes that have resulted in horrific wounds are seen here at the centre. We fortunate centre dogs proudly display our IAR collars but how sad it is to witness our fellow creatures coming in with an entirely different story. Recently there was a case so severe that we were all shocked and saddened by the obvious agony that a young bull calf had endured as a result of this type of negligence. At several months old, young Cane was still snared by his new born baby rope. No one had released or loosened it and it was strangling him slowly. The rescue team were alerted to his plight and set out in force to help - it takes many skilled hands to perform a successful cattle mission. Cane is part of a fifty strong herd of free range spirited cattle and capturing him was no mean feat. Typically the herd will group together and protect a young or injured family member so the only way for the IAR team to apprehend him was to use a tranquilised dart fired into his rear. This is a dangerous occupational hazard for the team of vets; a herd can become very agitated, dangerous and unpredictable when alarmed. The marksperson’s aim of course has to be steady and accurate and requires nerves of steel and absolute precision timing. There’s a one chance shot. Inaccuracy would result in the dispersal of the herd and the lost chance to restrain the animal in need, or may even result in hitting the wrong animal. Thankfully ace shot Doctor Nikhil was right on target as usual. But even then the tranquiliser takes some time to have effect and often the sedated but still mobile animal can career around wildly covering great distance and has to be tracked by the veterinary team on foot, wherever the animal chooses to run. Cane was eventually overcome by the anaesthetic and gently settled into a drug induced sleep. The anaesthetic dose was determined by the estimated weight of the calf. Once Cane was peacefully on the ground, his two rear and two front legs were tied together for his own safety. Thanks to generous public donations, Animal Tracks is equipped with a special truck with the specific purpose of use as a cattle ambulance. With the aid of a large animal stretcher carried by many helping hands, the young bull was loaded aboard and soon on his way to hospital. 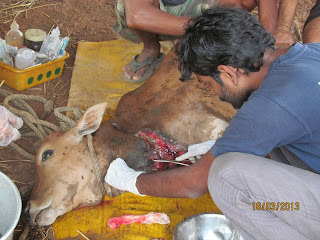 Once back at the centre Nikhil and the team were able to evaluate how severe Cane’s wound actually was. 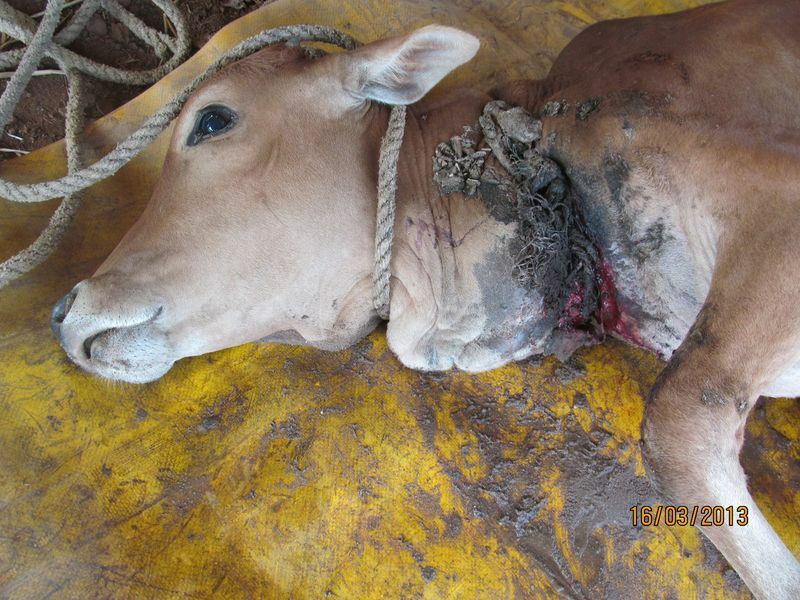 This poor calf had obviously endured prolonged and increasing torture. Cane was slowly being strangled by the tightening rope which had cut into his throat and neck, and become deeply embedded. As the skin had opened, the wound would have become infected at an alarming rate and become immediately susceptible to infestation by blow flies who like to lay their eggs in dead or decaying flesh. In just a few hours the eggs develop into the larval phase which we know as maggots. Maggots thrive in such conditions, feeding on decaying tissue, infected pus and bacteria. Technically maggots only eat dead (necrotic) flesh, and this is probably what most people associate them with, feasting on dead carcasses. But any debilitated or injured animal is always a target for the opportunistic blow fly. As dead tissue is eaten from a wound, live flesh is exposed beneath it. This quickly dies and festers, providing a continuing food source for the maggot and bringing unimaginable pain and suffering to the animal. From the moment a maggot develops it starts its relentlessly voracious flesh devouring campaign. These are pretty gruesome facts but sadly it’s the harsh reality that has to be dealt with on a daily basis. Not all maggot wound cases that come to Animal Tracks are treated successfully. Sometimes the infestation is so out of control and the maggots have been able to burrow so deep into the animal that they invade the brain and other internal organs, and these cases nearly always prove to be fatal to the animal. The poor host creature is literally eaten alive, having first endured a prolonged period of immeasurable pain and suffering. So never ever disregard an open sore and always seek medical advice if your animal appears to have even a small open wound. Our amazing team have strong stomachs, that's for sure! But back to Cane and his story... The team immediately set to work while he was still sedated and secured. 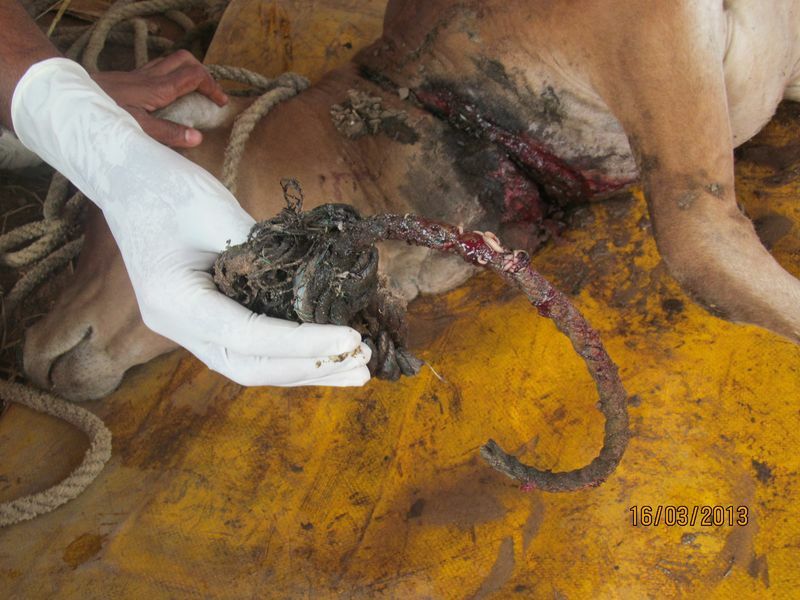 The embedded rope was slowly and carefully cut free, exposing even more of the infected and infested wound. Next the wound was cleaned with an antiseptic wash and each individual maggot removed by forceps in a long, laborious process. This is a painstaking job that requires a keen eye, a strong stomach(!) and a lot of patience to ensure that not one maggot remains. This was then followed by another thorough wash with saline and an application of antibiotic powder. 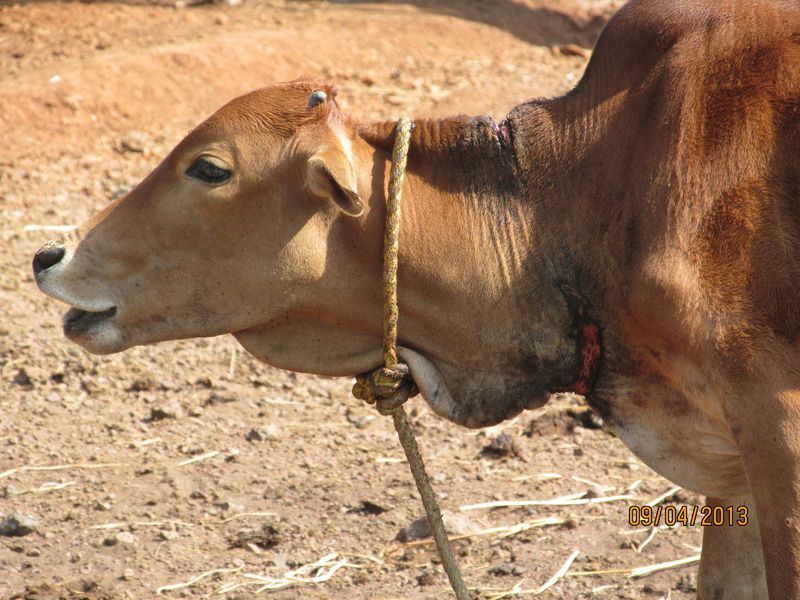 But in such deep and infected wounds, the raging bacteria can soon become resistant to antibiotics. The prognosis did not appear to be very optimistic for Cane’s recovery, so the vets decided that this seemingly almost hopeless case was an opportunity to use a tried and trusted age-old natural remedy: sugar. It may sound unconventional but sugar therapy has successfully been used to heal wounds and treat pain for 5,000 years. Sugar, the normal, household type, was used to pack the wound before it was loosely dressed. This allowed the sugar to dissolve in the septic fluid and naturally draw out more of the infection. Bacteria is unable to survive in these conditions so the swelling and inflammation is reduced. This natural treatment also promotes granulation (formation of new connective tissue and blood vessels) to the wound surface, and encourages healthy skin to grow. Thankfully this sweet solution (in conjunction with regular antibiotics and frequent antiseptic dressings) has proven to be very successful with this young bull. Cane continues to heal and will soon be back with his herd, and will no doubt be keen recount his experience! IAR Goa who saved his life for sure, but the vital role of a humble bag of sugar in his miraculous healing process should not be forgotten. My musings are usually bitter sweet by nature but this one’s an actual sugar Cane sweet success story. This amazing recovery is all part of everyday life at Animal Tracks where modern, innovative drugs and veterinary methods work side by side with homeopathic medicine and ancient natural healing remedies.